Many readers grew up reading Roy MacGregor's extraordinarily successful Screech Owls series of middle grade novels about the peewee hockey team. For adventure and mystery and, of course, hockey, these were the go-to books for kids. Now, for a slightly younger set–let's say early middle-grader–Roy MacGregor has teamed up with his daughter Kerry MacGregor to take their minor hockey team, the Ice Chips, on the road but through time and history too. 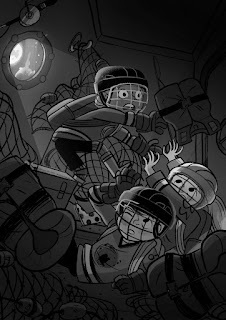 And, in The Ice Chips and the Haunted Hurricane, the kids meet a hockey hero and a few ghosts as well. Lucas Finnigan a.k.a. Top Shelf and his friends and teammates Swift, Edge and Crunch decide to recreate their initial magical experience of time slip that had them meeting Gordie Howe. They know that after Scratch, the magical Zamboni, resurfaces the rink with its magical flood and they skate across the centre line, they will be transported ... somewhere, sometime. But, as the Ice Chips are again matched up against their ice nemeses, the well-equipped and moneyed Stars, they know they are at a significant disadvantage, especially having lost valuable time waiting for the Riverton Community Arena to reopen. So Lucas, Swift and Edge, this time prepared with walkie-talkies, a camera, boots–they can't walk around in their skates everywhere–and other tools, and Crunch staying behind as tether with a walkie-talkie, jump back in time and into their newest adventure. Strangely, the kids find themselves on a boat in the middle of a storm and it's two other Ice Chips, Bond and Mouth Guard, who unknowingly followed the trio of time-travellers to Nova Scotia, who meet a young hockey player and introduce him to the others when they're finally reunited. Though the kids don't connect the dots about this young star from Cole Harbour until near the end of the book, they're still impressed by his determination and drive, especially after taking them through some intense and very worthwhile hockey drills at the Citadel in Halifax. There's also a few encounters with ghosts including a sea captain from the Halifax Explosion, making The Ice Chips and the Haunted Hurricane a bona fide story of the Maritimes. Hockey fans will definitely love the scrimmages on the ice, well told by Hockey Hall of Fame inductee Roy MacGregor and journalist Kerry MacGregor, but they'll be grabbed by the story of kids finding themselves in new circumstances, getting guidance from hockey greats and working together to find their way home. With Calgarian Kim Smith's illustrations to give the story some graphic spice, The Ice Chips and the Haunted Hurricane will be taking home a win. 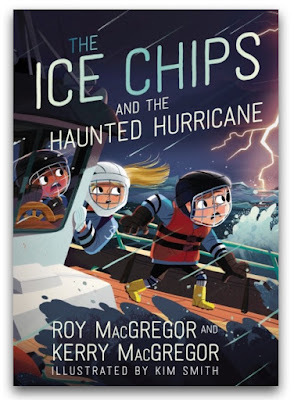 Though it will still be a few more months until The Ice Chips and the Invisible Puck comes out in April of 2019, I'm pretty sure that authors Roy MacGregor and Kerry MacGregor, who plan to make Swift's idol, one of Canada's most decorated Olympians, the focus of that story, will be able to keep up their stickhandling magic.